Fall Protection Systems – Summit Anchor Co. The designer needs to understand OSHA’s use of definitions to avoid confusion when designing fall protection. Below are questions and answers to OSHA’s definitions to fall protection in OSHA’s Subpart D. It cannot be emphasized strongly enough that OSHA requires that a qualified person design a fall protection system. Fall protection is a broad term that covers any equipment, device or system that prevents an employee from falling from an elevation or mitigates the effects of such a fall. How can fall protection be managed? Fall elimination: Eliminate the possibility of fall at heights. Fall engineering controls: Protect workers by removing hazardous conditions or by placing a barrier between the worker and the hazard. Passive systems like a guardrail system are examples of engineering controls. Fall arrest: The fall arrest equipment stops a worker from continuing a free-fall from the edge of a building. Fall arrest is part of personal protective equipment, but, however, is less effective than elimination or engineering controls. Administrative controls: These controls endeavor to limit or manage the risk by measures such as warning lines, safety observers, or a company safety policy and safety training that prohibits workers from approaching the edge. However, administrative controls have limited benefit because they do not prevent a worker from going over the edge and falling to his death. Of the four above ways to manage fall protection, number one, fall elimination, and number two, engineering controls, are best practice and most effective. What is a personal fall protection system? Personal fall protection system means a system designed by a qualified person an employer uses to provided protection from falling or to safely arrest an employee’s fall if one occurs. Examples of personal fall protection systems include personal fall arrest systems, positioning systems, and travel restraint system. What is a personal fall arrest system? A personal fall arrest system is used to stop or arrest a fall in progress of a worker from striking a lower level. It commonly consists of a (1) full body harness, (2) anchorage, and (3) connector. While the equipment for a fall arrest system may be the least expensive to purchase, OSHA requires specialized training on how to properly use the equipment. Fall arrest training must include rescue training because of the potential for suspension trauma. What is a travel restraint system? 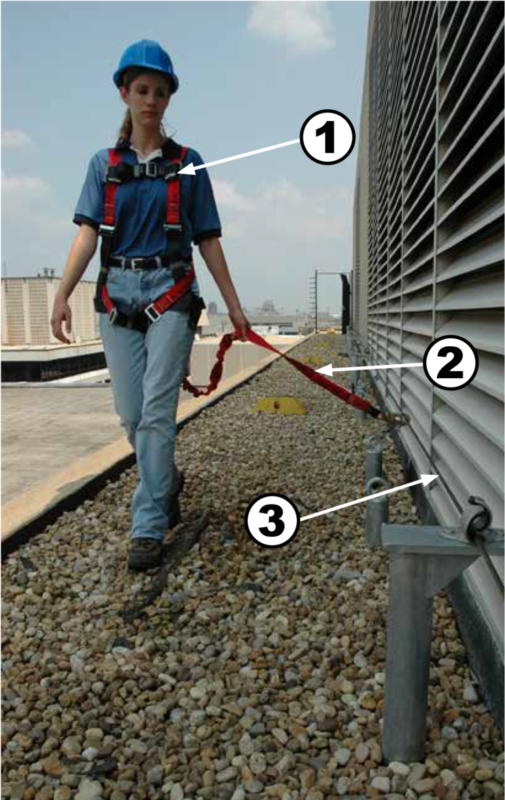 Travel restraint system means a combination of an anchorage, anchorage connector, lanyard (or other means of connection), and body support that an employer uses to eliminate the possibility of an employee going over the edge of walking-working surface. *Note: A retractable lanyard can be used with an anchorage as a system to eliminate the possibility of the worker going over the edge. For example, if the retractable lanyard’s maximum length is 8 feet, then the distance from the anchorage to the edge of the building needs to be at a 10-foot minimum to keep the worker in fall restraint. In other words, keeping the lanyard 2 feet shorter than the edge distance can eliminate the risk of a fall. At what height(s) does OSHA’s require fall protection? General Industry: OSHA requires fall protection at elevations of four feet. Construction Industry: OSHA requires fall protection at elevations of six feet. What are OSHA’s edge distances requirements? Again, there no one rule that fits all. OSHA has one rule for general industry and another for construction. Within OSHA’s construction regulations there may be variances to the rule depending on the trade and 28 OSHA-approved state plans that are required to have standards that are least as effective. See Federal OSHA’s edge distance requirements below for both general and the construction industry. 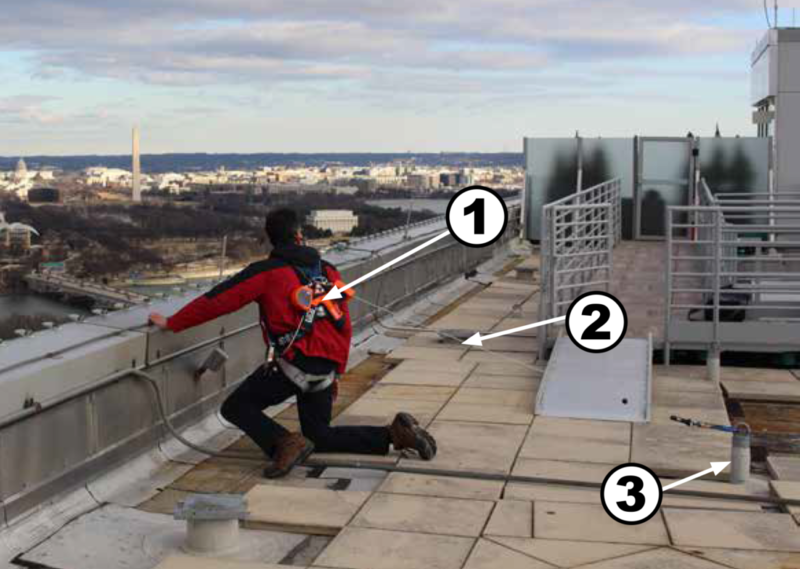 “When work is performed less than 6 feet from the roof edge, the employer must ensure each employee is protected from falling by a guardrail system, safety net system, travel restraint system, or personal fall arrest system.” (OSHA’s Subpart D. Section 1910.28 section 13(i)) (See Fig 5 &6 pending addition). “When work is performed at least 6 feet but less than 15 feet but less than 15 feet from the roof edge, the employer must ensure each employee is protected from falling by using a guardrail system, system, safety net system, travel restraint system, or personal fall arrest system. The employer may use a designated area when performing work that is both infrequent and temporary.” (OSHA’s Subpart D. Section 1910.28 section 13(ii) (See Fig 7 & 8 pending addition). What size hole, space, or gap in a roof or horizontal walking-working surface requires fall protection? Do roof hatches require fall protection? Yes, when a roof hatch is open it is a hole in the roof that is regulated by OSHA. One way to provide protection from such openings in the roof is with a hatch guard with walk through rungs. What are acceptable means to protect a worker from a hole, skylights, or roof hatch?